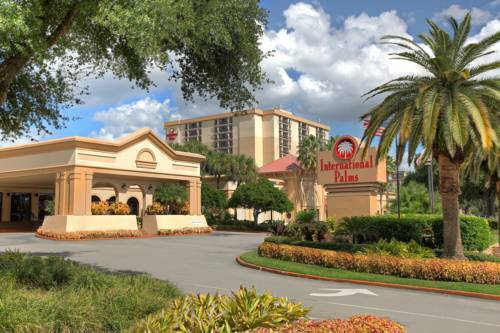 With easy access to many Orlando attractions the International Palms Resort and Conference Center Orlando is the ideal vacation destination for the entire family. Visit Universal Studios Sea World and the many thrilling theme parks and attractions located just minutes away from our International Drive hotel. Offering several on-site activities guests can enjoy our refreshing pool or whirlpool fitness center various dining options and more. Best of all we are near Universal Studios and offer free parking. With easy access to many Orlando attractions the International Palms Resort and Conference Center Orlando is the ideal vacation destination for the entire family. Visit Universal Studios Sea World and the many thrilling theme parks and attractions located just minutes away from our International Drive hotel. Offering several on-site activities guests can enjoy our refreshing pool or whirlpool fitness center various dining options and more. Best of all we are near Universal Studios and offer free parking actions located just minutes away from our International Drive hotel. Offering several on-site activities guests can enjoy our refreshing pool or whirlpool fitness center various dining options and more. Best of all we are near Universal Studios and offer free parking. Serving breakfast lunch and dinner the Front Street Cafe overlooks our tropical pool area.